The Cinnamon desktop can be themed and its features can be extended by adding applets, desklets and extensions. In Cinnamon lingo, all these addons are referred to as “spices”. The goal is to let you spice up your Cinnamon experience so you can enjoy your desktop environment, feel even more at home with it and benefit from niche features and look and feel which go beyond what is developed by the Linux Mint and Cinnamon teams. 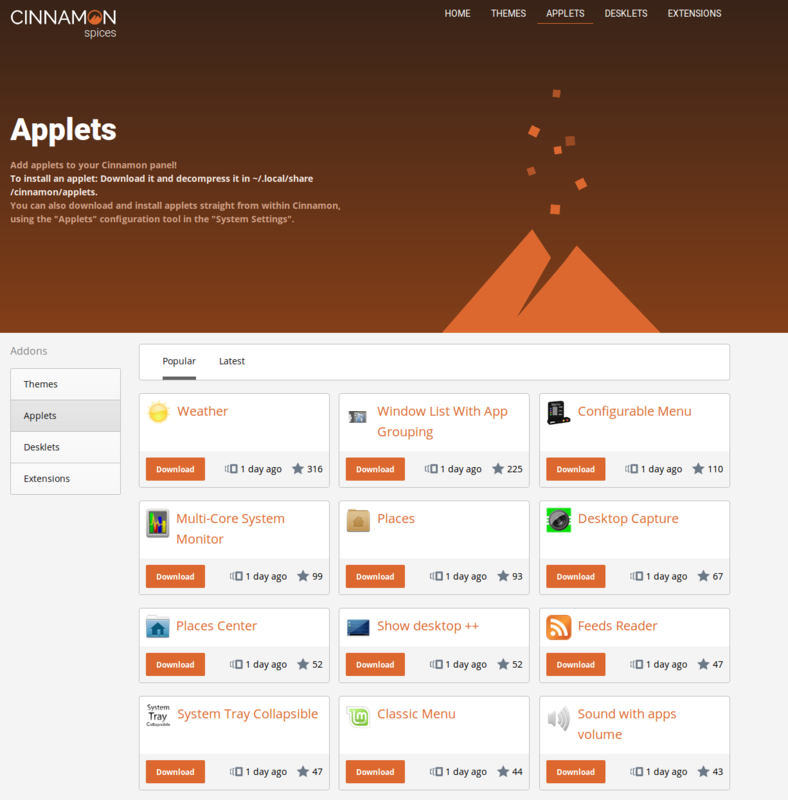 Spices can be installed from within Cinnamon -> System Settings -> Applets/Desklets/Extensions/Themes, or by visiting https://cinnamon-spices.linuxmint.com. Throughout the years we’ve seen great spices being developed by 3rd party artists and developers. The “Weather” applet developed by mockturtl is an example of a very popular spice. Just like a killer app, it’s something many people add to their environment right after a fresh install. Spices like that greatly enhance the user experience in the Cinnamon desktop. Unfortunately, throughout the years we’ve also seen spices deteriorate that experience by bringing down the overall quality of the Cinnamon desktop. Some spices aren’t packaged properly and thus cannot be installed successfully from the System Settings…. some spices don’t work at all, and in some extreme cases we’ve even seen some spices make the Cinnamon desktop crash or fail to load. Another issue is security. In an ideal world we provide the platform for users to enjoy 3rd party development and for developers to reach their audience in the simplest possible manner. In practice, and we’ve seen this last year when our project and users were the targets of specific attacks, we can no longer blindly trust 3rd parties and expose users to them directly. All changes coming from sources we don’t trust must be reviewed to guarantee the absence of malicious code. It’s hard to reduce empowerment and raise expectations while explaining a trust issue to 3rd party developers and artists (although the changes we’re implementing also bring a lot of benefits to them which I think some of them will really enjoy) and we’ll do this on Segfault with a separate blog post. In this blog post, I’ll address the Cinnamon users and explain the changes we implemented. Before I start I’d like to thank to Design Team, and in particular Eran Gilo for his beautiful design, and Carlos Fernandez, Darryn Bourgeois and Nick Karnaukhov for their amazing work on the implementation. I’d like to thank the Development Team also for helping me define all these changes and discussing them with me. The first thing you’ll notice when visiting https://cinnamon-spices.linuxmint.com is the new look and feel. You’ll also notice that you can no longer login, logout or register on the website. The reason for this is that a second update is coming. The Design Team is currently revamping authentication, comments and ratings. In the past you needed to sign up on the website, wait for an email, log in and then you could comment and rate spices on a scale of 1 to 5. This is all getting changed. We don’t need to know your email address or to store your password and we no longer want to. You’ll no longer sign up or login with us. You’ll have the ability to use your existing online identity so you’ll review and rate as yourself directly, without needing a dedicated account. We’ll very likely support Facebook, Github and Google, and possibly other social networks. Ratings will be simplified. In the past you could downvote spices and your rating carried the same weight on the score whether it was done last week or 4 years ago. This made it easy for people to trick the system unfairly and it made it hard for new spices to compete with established ones. Going forward you’ll only be able to “like” things. Spices will be considered “popular” not only because they received many “likes”, but also because they did so “recently”. All code changes affecting spices are now version controlled. All code changes made by untrusted parties are now reviewed. Spices used to be developed solely by their author. They’re now maintained co-jointly by their author, the Development Team and a new team made of trusted Spices developers. In the past, if the author of a spice didn’t fix something, it never got fixed. In contrast, anyone can fix bugs in spices now. The Development Team can commit the fix directly into it and anyone else can provide a fix via a pull request on github. It doesn’t mean all bugs will get fixed, but it’s certainly going to boost bug fixing in Cinnamon spices. Maintenance is centralized and bug fixes can be done across the board and affect multiple spices. If somebody fixes something in one spice and the same fix could be applied to other spices, that person has the ability to provide a single fix affecting multiple spices. In the past, this rarely happened, because it would have required an author to communicate with other authors and for them to copy over their fix. The development of spices now happens on Github. It’s all version controlled and using top of the art technology and the same tools we’re using to develop Cinnamon itself. Changes made on Github are synced automatically towards the https://cinnamon-spices.linuxmint.com website and towards your desktop environment. If we fix a bug on Github, a few minutes later it’s there on the website and your Cinnamon desktop sees it as an available spice update. If you browse the website and look at a particular spice, you’ll see when it was last edited and what its last commit is. If you click on this commit hash, you’ll see its Git history, i.e. all the changes that occurred to that spice. Be aware that when the authentication/comments/rating revamp arrives we’ll reset all the scores to zero and we might also start from scratch on the comments. All spices kept their existing “uuid” (which represents their unique identity) except for themes (which didn’t have any in the past). In layman terms this means that changes made to applets, desklets and extensions will be detected by your Cinnamon desktop as new versions of these spices… but this won’t happen for themes that you already installed, since their uuid changed. If you installed themes, please remove them and reinstall them. Once this is done you’ll be able to update them again when changes are pushed. I’m happy to see those improvements! I created some desklets (see fthuin) and one of the main reasons that I was (very) late to answer to comments was I didn’t receive any email when a comment was posted. Will you fix that? Edit by Clem: No, we’ll actually stop storing emails going forward. You’ll be notified by email via github though whenever someone @yourname there. Edit by Clem: Changelogs and versions will disappear as we go forward. Changes happen on github via commits. When the server pulls changes from github it checks for impact on each of the spices. If a spice’s last commit is different than the one the server remembers, it updates its timestamp and regenerates its archive and the JSON metadata used by Cinnamon, so your computer is able to upgrade to it. In regards to browsing changes, you can click on the last commit from the spice page and that brings you to the git history for that spice, where you can see who changed what and when. Edit by Clem: It’s coming it’s coming, but one thing at a time 🙂 We also have the KDE edition going towards stable and we’ve got new LMDE ISOs getting into BETA. Looks beautiful and professional, thanks for the hard work. What I would like though is that each item have tested compatibility notes, part of the description, with various versions of Mint. You will no doubt do as others do and dismiss this post out of hand. Social networks are literally death sentences for many of us. Dozens are in prison in my country for using facebook – I and many of my peers would and will NEVER join this insidious organisation. We are compelled to list all our social networks U/N AND Password, which is entered on the Govt. database. Edit by Clem: Facebook will be one option among others, if you don’t use it that’s ok, you’ll be able to use something else, Github for instance. I actually encourage authors to use github as their comments will match their changes and author name on the spices. That’s something we can even automatically highlight on the website itself. But I think a search function should be added.E.g. to list all numix-based themes. Of course you can use the browser’s search, but that involves jumping around the page. And a new favicon (the “o” in the Cinnamon logo on top)? Edit by Clem: They talked about the favicon within the design team and somebody’s planning to have it done this Sunday. There’s also a couple of visual bugs (alignment at the bottom of the desklets list, margin on the left with low resolution etc..), they’re aware of that and they’ll fine tune the design going forward. Now Cinnamon and Mint could looks more modern. In my little opinion Mint needs something like that. Your distro works great with cinnamon bot style of grey background in windows coulb be a liitle refresh. This seems like a welcome change, thanks to the team for all your hard work. What’s the story going to be like now for independent spice development? Will it still be possible to install spices from a 3rd party repository? Or even directly from a bundle? Edit by Clem: Oh yes, you’ll always be able to download spices directly from the Internet and install them manually, that’s none of our business and we’ve no expectations to have when it comes to that. Delivering quality is our responsibility though when you use our spices website or install things directly from within Cinnamon. Congratulation Clem and mint team, The design is very nice. But the most important think is that mint team with take care of the applets,desklets,themes and extensions. I have one request. Please redesign the notification applet. it looks old and boring. I like the way Budgie desktop environment shows notifications. Thanks for all the great work. have a one-button operation like the older versions of Mint did by hitting PrintScreen? Clem, you and I have chatted before about the flag issue. ie choose UK on initial install and the Union Jack is shown on each subsequent login. I am in N.Ireland and have to choose Dublin during install to get the Irish flag. Not that I want the Irish flag in particular but if I am out and about and someone is looking over my shoulder while I am logging in I don’t want assumptions made as to my political affiliations or lack of them. The Irish flag is generic enough that it avoids this problem. Please keep a totally separate login process as Brian says above. There is quite enough identification through social media and other ways as it is. Government and others are watching. Edit by Clem: Hi Jerry, I understand. I’m not sure your example is pertinent because the flag should follow your locale, not your timezone (i.e. you would choose English (Irish) as the Language, and Belfast-UK as the timezone I think). I might be wrong, I don’t know. But in any case that’s just about the example you gave me. I completely understand that this can be an issue. Even within one and the same country, using a flag can be regarded as being nationalistic. We should have an option to disable that and I’ll try to get that implemented in the future. I can see that issue on Macbooks and funnily enough I’m in Ireland, using English (UK) to get a Macbook keyboard layout and so the keyboard applet is showing me a Union Jack as well. It’s configurable there and it should be configurable in MDM as well. Thank you and your team for your efforts to make Linux Mint to a product which is very powerfull and secure. The security improvement for the “spices” are necessary to close backdoors for malware etc.. I’m an experienced user and so I can tell you, that your products will become more secure and smarter with every release, but everybody should keep in mind, that every user is responsible for the security of it’s own equipment. Please keep Linux Mint on running with this high quality. NICE!! One of my only few cons about Linux Mint has been addons being outdated and unregulated. I’m so glad this is changing! Keep up the great work! please focus on the bugs. Hi Clem, great and overdue decision, although it means a lot of maintenance for your team. Will there be the possibility (at some time) to update all spices altogether in LM, not each type seperated? I also vote for a filter, at least on the webpages, to have the possibility to exclude the themes of one artist for example, or to see all spices from another. Thanks for caring, fixing and developing my favorite os and desktop. I’ve never wanted to put it on github cause i hate everything that means share service. So how about you guys help me remove my desklet from everywhere? Edit by Clem: Done. I don’t share your opinion of Github but you’re entitled to it. Your two spices were removed. I have a suggestion. If you are going to provide a direct download from the site you should have instructions for manually installing themes, applets, desklets, etc. Edit by Clem: They’re there in the header section. I second Gerald’s comments. Much thanks to your team for all the excellent work.And security is becoming more critical every day.Which also leads me to second Brian’s comments. This is serious stuff. Don’t know what country he’s in, but “The Land of the Free” continues to move toward totalitarian rule.People need to focus on the critical issues at this point. Microsoft intends to assimilate Linux, & they are not to be underestimated. Strong defenses are no longer optional. I think you’ve trodden the fine line between taking ownership of spices security and compatibility and not disgruntling the developers admirably. The new spices site looks fantastic! I only hope you will let this team lose on the Mint website as I feel it’s important for the image of Mint, especially as it is probably one of the first things someone will see when shopping around for a distro. P.S. Could you clarify the comment regarding spice updates being directed towards user desktops… does this mean they will appear as updates in the update manager? Edit by Clem: No, the Update Manager only supports package updates and Cinnamon doesn’t check for spice updates automatically. What I mean by that is that Cinnamon is able to detect new spices when you reload the cache (i.e. when you click on “get more online” and “refresh the list”). As you can see it’s still manual on the client side, but it used to be manual on the server side as well.. developers had to zip their files, update their changelog and re-upload the zip. Now as soon as a commit is pushed on the master branch, it all gets regenerated automatically. or are we saying that your team will ensure that the spices listed will work with Cinnamon 3.4 by contacting the developer and informing them that certain code changes are being made on their behalf to make the spice compatible, and if they can’t be made compatible they are hidden from the search. Would that might cause problems for those that choose not to update their system every release and remain on older versions of Cinnamon? Edit by Clem: No it’s even better than that. We now have the ability to update themes directly. So even before 3.4 is out, if we push a change which will require themes to adapt to it, we can also push changes in the themes ourselves and give them support for 3.4 even before it’s released. Hi Clem, Can we Spices integrate ratings, comments, etc with Cinnamon desktop (like how we have for Software Manager)? Also, there can be one applet that shows list of recent updates to x-lets? Edit by Clem: Hi Anand, we’ve no plans for such an applet right now. but it’s a good idea. 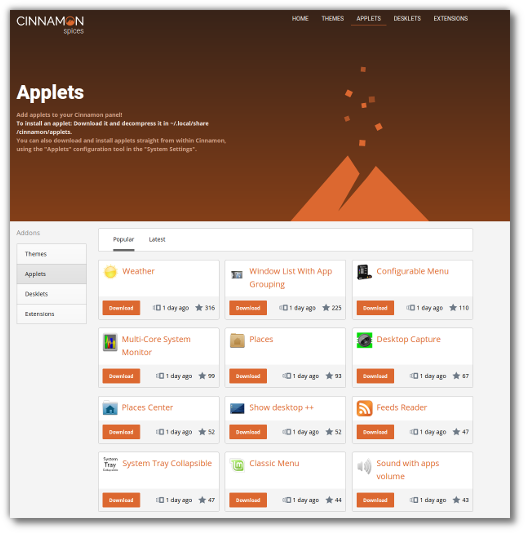 As the Cinnamon ecosystem grows, I feel, there is a need to assign a Category to each applet / desklets to ensure that in future users can filter items based on category. Edit by Clem: Same thing, all good ideas, but the plan right now is to do better, not to take on more. Will these changes allow us to have our themes kept up-to-date with the update manager? I don’t use spices other than themes so I have no idea how it’s supposed to work. Edit by Clem: No, but when we’re done I’m really hoping everything you find in System Settings (applets, desklets, themes, etc..) will install and work properly. What will this do to little folks like myself that have adjusted an applet desklet or theme to suit themselves? I don’t care if others have it and I don’t care to share it or have to post it publicly. I put it in ~/.themes or other appropriate folder and enjoy my design. Edit by Clem: No impact on this at all. You can still place spices in there just like you did before and their format/structure isn’t changed. Clem it appears Cin 18.1 broke theming all my Glass themes that are black glass on the menu are now a light grey glass !! Edit by Clem: Yes, that’s the removal of boxpointers in Cinnamon 3.2. We’re going to remove a lot of themes which haven’t been maintained for a while, but on the ones remaining we’ll be helping and fixing these issues. Why no Global Menu there? Finally! 🙂 I kept looking for news on the new spices website since the relaunch announcement was published, so I was excited about it. – the whole collection is presented on the page, instead of a limited number per page, on multiple pages. Because of all these reasons, the browser hardly keeps up with the high volume of big images to download and some of them eventually fail to download (ERR_SPDY_PROTOCOL_ERROR). I think that the themes and applets which do not work should be removed from showing in settings menu.If a theme is broaken in any specific cinnamon version, it should not be shown to that user. Because, the highly rated applets like configurable menu,window list with App Grouping,System Tray Collapsible and many more are broaken in latest cinnamon versions.I found that they were lastly updated years ago.This leads to crashes also.The new users will tend to install these applets as they have high scores and leads to regressions.So it is better to only show applets that really work. I have provided this picture with a great looking Avant-window-navigator taskbar. Linux Mint, PLEASE do change the looking of your taskbar/panel. We deserve much better than it is right now. Anyways, thank you for such a great operating system! Thanks Clem and Mint team for these much needed steps to update the Cinnamon spices. The new site looks marvelous and looking forward to see how it matures. It would be a HUGE improvement if the themes/applets/desklets/extentions could all be verified for their compatibility for the various Cinnamon versions. At present, so many of them are either fully or partially incompatible with Cinnamon 3.0 and later. It should fall upon the dev’s to publish what versions of Cinnamon their Spices are compatible with. A further improvement would be to streamline the Mint “Themes” settings panel, so that it better synchronizes with the new Spices repository. Of course, I know all of these things take time, and I am very pleased to see this aspect of Mint Cinnamon is moving forward as it was much needed. Thanks to all once again! This is great! Good work! Just to confirm, I’m seeing the same issue as #30 on a well specced machine with a broadband connection. Many others must be having this issue. As a minimum, please at least re-encode the previews to .jpg because it really impacts the functionality of an otherwise excellent site. Will there be also a sub-cathegory for ICONS and WALLPAPERS? Is there any way to make in the future other theming elements (like mouse pointers, controls, icons, windows borders) installable as easy as the desktop theme can be installed from the online available themes? This could open new possibilities. Speaking about improvements, in my opinion a new and more modern default Cinnamon Menu should replace the current one, which looks more like a improvisation forgotten in this form. – As a user I like some extensions written for an older version of Cinnamon. They seem to work with the latest version, but I can’t confirm this thoroughly. Should I create a pull request with the latest Cinnamon version put in metadata.json or should I just wait until you do it or is this behavior obsolete soon? – Some spices are tagged to be possibly unstable for Cinnamon (dangerous=true in metadata.json). Will you change the code to avoid this if the author doesn’t correct it or will these spices be removed sometime or will they stay “dangerous”? Congtrats Mint team! Very Nice !!! Is there a possibility to Have Gene effect werking on Mint Cinnamon? IT is the only thing I wish to Have. Further Linux Mint is werking perfectly, I AM very glad that I can use IT!!! Thank you! (where can i tell the community that if someone can and would like to develop something… my idea could be nice? I always liked Cinnamon Spice but Sporty Spice was my favorite. Especially with Brian Adams ‘When Your Gone’ Thanks Mint for the opportunity to lighten up a few of the commentators. Merci. Anybody know what happened to the Accuweather desklet? I can’t seem to find it in the new list of desklets. Edit by Clem: Hi Dennis, its author asked us to remove it. He considered Github to be a social network and didn’t want his work to be hosted there. Thanks Clem! I really liked his Desklet and don’t really care for the other 2 weather desklets currently in the list. Edit by Clem: Maybe he’ll distribute it some other way. There seems to be a fork of it at https://github.com/tipichris/bbcwx also. The upcoming PlayOnLinux 5 will be customizable with themes. If anyone of you would like to provide a theme for Linux Mint/Cinnamon, you’re very welcome to do so on: https://github.com/PlayOnLinux/POL-POM-5. What’s with the vertical stacking of the themes on that page? make as if I’m viewing the content from a mobile phone! This is the ultimate silliness. When leaves Changes to Cinnamon Spices? I experience an issue with the clock desklet (probably all desklets have this issue): if you put the desklet in the top left corner of the desktop, and then plug in a usb drive, the usb drive icon will appear *underneath* the desklet, and you can’t click on it because the desklet is “in the way”.